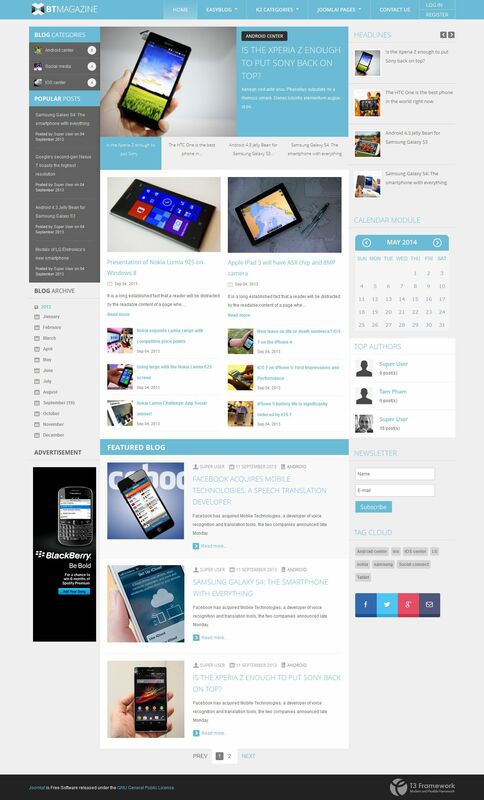 BT Magazine - template with stylish design and decor of the design team studio BowThemes. Bad choice for the online magazine, news site, portal and blog. Modern design and rasplanirovka template retains its structure and correctly displayed on the monitors of any devices, from cell phones to large monitors. In BT Magazine used multifunctional library T3 Framework-3, which corresponds to the new web standards. The structure of the template is to support the most popular blogging EasyBlog expansion and powerful content manager K2, which provide comfort publishing. The well-optimized template BT Magazine additionally added extensions studio, it supports all popular browsers and is fully adapted to operate on mobile platforms.